They are mystic medieval musicians. Nomadic. Wandering from place to place. Singing and dancing to the mere accompaniment of the "ektara"-a simple one-stringed instrument. Their music, and their poetry, talks about man's relationship with God. They say, a person's physical body is the place where God resides. Although influenced by Hinduism, Buddhism, Vaishnavism and Sufi Islam, they're totally distinct from each of them. Their religion is that of freedom. Freedom from conventional, organised religious shackles, while emphasising on achieving spiritual liberation. We're talking about the Bauls of Bengal. Generally hailing from rural Bangladesh and West Bengal, Bauls or Baul "sangeet" has always held a special place in our history, culture and traditions. They are said to have music in their blood and their creations are nothing but a folk dialect of Bengali music-highly spiritual, but far, far away from religious dilution. Even UNESCO, in the year 2005, declared this community and their art form as the Masterpieces of the Oral and Intangible Heritage of Humanity. Like every land has music of its own, the roots of Baul music and culture can be traced back to the "lal matir desh" or land of the rare red soil. And this is why West Bengal's Birbhum district and adjacent areas are fondly referred to as the heart and soul of Baul music. Every year, mostly during winter, the heart of "lal matir desh" warms up with the soulful Baul music lingering in its air. Vibrant Baul festivals, held at different parts of West Bengal and Bangladesh, literally bring these sleepy hamlets to life, of which anyone barely thinks of the rest of the year. For a few days or a month at most, people from across the nation and beyond throng to these off-the-radar villages to be part of a unique experience. An experience of liberation through songs that speak of love, freedom and peace. So when and where can you experience these one of a kind Baul festivals? Mark your calendars, as we've got it all sorted out for you. Let's take a look. Poush Mela in Shantiniketan, Birbhum is the most important and colourful festival of the region. What started as a small family affair by the Tagores, has today become one of the international events that Bengal is identified by. Apart from tribal dance and local rural art forms, what lures millions of visitors from across the world is the festival's Baul musicians. Artisans and singers, keen to showcase their skills, flock from numerous adjoining villages. The evening stage is mostly reserved for them and open-stage plays begin at 10 pm in the night. But there are no chairs or proper seating arrangements for that matter. Think sitting on the ground and listening to music that has its origin in that same rural soil. On a chilly December evening, the ambience, simply put, is mesmerising. How To Reach- Shantiniketan is some 200 km away from Kolkata. There are regular buses, as well as trains, from Sealdah station that can take you to Shantiniketan. You can consider Jaydev Mela as Bengal's answer to New York's Woodstock Festival. It takes place at the remote village of Kenduli, Birbhum-on the banks of river Ajoy-which is also the birthplace of the famous poet Jaydev. The annual fair is organised every year on the occasion of Makar Sankranti, from January 14th to 16th, and continues for 3 days. The Bauls and sannyasis arrive at the mela a day before the festival. Day one is inaugurated with a holy bath in the Ajoy river. The Bauls sing in their own "akhrasi(s)" or tents, which continues to the second and third days of the mela. The final day is called Dhulat ("dhula" means dust), as according to Baul philosophies, everything mortal ultimately goes back to dust. This day is celebrated with colours and embracing each other to bid "vidaya" or goodbye. The festival ends with tearful eyes and happy memories. How To Reach- From Kolkata local trains are available every 2 h and SBSTC buses are available every 30 min to take you to Jaydev Kenduli. In Gourbhanga (district Nadia), every villager can sing. Music, literally, wafts in its air and tunes float around in this tiny hamlet. And every year, during the festival, over 150 fakirs from the neighbouring villages come together for three days to simply sing, chant and dance. All of this generally takes place in the month of February. On cold nights, people flock around firepits near the shelters of the fakirs, and they let their minds and souls flow along with the rhythm of heartfelt music and poetry. How To Reach- A road trip to this place is undoubtedly the best option. Otherwise you can take a bus or train from Kolkata to reach Krishnanagar, and from there board another bus to reach Gorbhanga. It's one of the largest fairs that West Bengal celebrates. It is held at the confluence of Ganga and the Bay of Bengal, and this is where the name Gangasagar has come from. Mid-January usually marks the beginning of the mela. Pilgrims and travellers from far and wide flock up in this region-for a holy dip-making this festival a glamorous one. 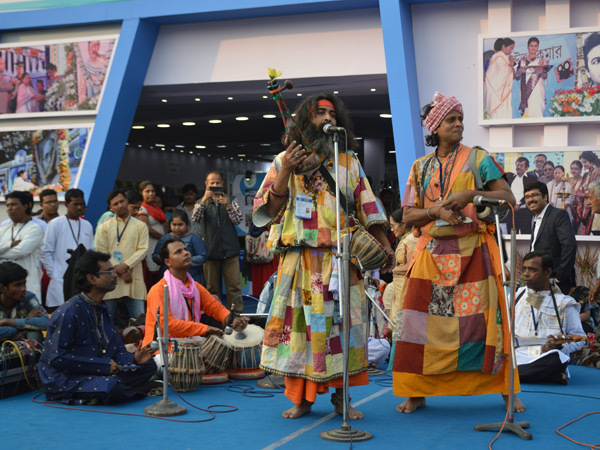 In this three-day-long festival, the Baul mela begins on the day the Gangasagar Mela is supposed to end. Do not get surprised if you see the audiences of a Baul performance in tears. Some of their songs are so moving and they touch a hundred chords. How To Reach- You have to take either a bus from Esplanade or a train from Sealdah to reach Kakdwip. From there move to Hardwood point, cross the river on a ferry and board a bus or jeep from the other side to go to Sagar Island. The world is changing at a breakneck speed. There was a time when Bauls were closely associated with contemporary intellectual circles-famous politicians, filmmakers, poets and who not. These cult artists and their art have inspired creators like Satyajit Ray, Mrinal Sen and Ritwik Ghatak. But sadly, the newer generations barely even know about Baul history and this famous art form. It's these Baul festivals that should be highly leveraged to reignite the spark and get Gen Y interested in this global art form. Even art form would be an understatement; Baul, rather, is a way of life.